Lee’s Laundry opened around 1890, when it was owned and run by Hop Lee. It did not, however, always occupy the present location. In 1890-91, it opened at 227 Princess Street before moving to 30 Montreal Street in 1894. 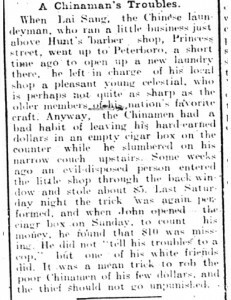 Ownership of the Montreal Street laundry was turned over to Ching Lee in 1895, and Hop Lee moved to 395 Princess Street. In 1902 Hop Lee died in transit to China to visit family. In 1927 a descendent of Hop Lee opened Lee’s Laundry at 61 Division Street, and it is still in business under the ownership of the Lee family. 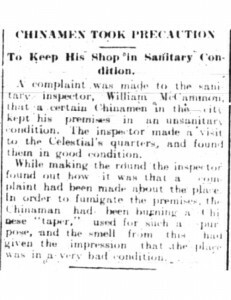 This feature of moving locations and transferring the ownership of the business between Chinese laundrymen was common practice in the early 20th century. It demonstrates the community support that was prevalent in the Chinese enclave, as businessmen who had established their laundries over several years sought to help new Chinese arrivals in the city. The laundromat business was extremely popular with Chinese immigrants in Kingston and throughout Canada. Chinese immigrants both owned and operated laundries, and often employed other Chinese. It was popular because laundries did not compete with the white labour class. Laundry was commonly thought of as “women’s work” and thus unsuitable for “white” men. The Chinese flocked to this service-oriented business and were very successful. They were able to offer low prices to customers while avoiding competition with the white working-class. Small businesses, such as laundries were vital to Kingston’s Chinese community, allowing immigrants the opportunity to engage in the municipal economy in a non-confrontational manner. This was a means of adapting to the “hostile” labour market in order to survive. 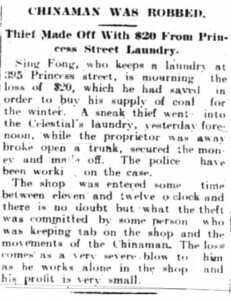 From 1890 to 1931, Kingston’s Chinese, who both owned and operated laundries, dominated the city’s laundromat business. This continued until 1931 when there was a decrease in the demand for hand-laundries. This decrease was a result of the Depression and advancing technology; as people no longer has as much disposable income and automatic machines began to replace hand-laundries. In the early 20th century almost all Chinese immigrants were involved in the service sector, employed or self-employed at laundries and restaurants. These businesses were called “ethnic businesses”. This refers to a business or group of businesses established by a minority group who seeks an economic niche in order to avoid competition with the dominant class – in Canada, white workers and their businesses. Most “ethnic businesses” rely upon family and community members to supply low cost labour. Due to this, “ethnic businesses” are more able to withstand economic hardship. One of the first Chinese in Kingston, Hong Lee, supported numerous other Chinese men upon their arrival by providing them with enough money to start their own businesses and expand Kingston’s Chinese community. “Ethnic businesses” were vital during the Great Depression of the 1930s in keeping Chinese businesses afloat. However, the Chinese who were involved in economic ventures outside this “ethnic business” market, suffered economic loss during this time.